Medicare Advantage program enrollment continues to grow year over year in a booming age-in market. For healthcare marketers to take full advantage of these growth opportunities, a detailed strategy will help optimize enrollment during both Age-In and the Annual Enrollment Period (AEP) running from October 15th through December 7th. Your Medicare marketing strategy should include a multi-channel approach, sophisticated targeting, best practice direct marketing, and a well-articulated product value proposition. Most Medicare marketers understand that Medicare marketing is no longer about renting lists of age-in prospects and sending direct mail to every eligible prospect in your target area. It’s not about simply placing newspaper ads in key markets or providing new material to your brokers about this year’s Medicare Advantage and Medicare Supplement programs. Medicare customers (including seniors), like customers in every other industry, have moved online, and expect to learn about Medicare and their options from a variety of channels. AEP direct mail continues to be the marketing channel driving the bulk of new members. While a multi-channel presence and strategy are essential, most marketers have found they cannot generate the volume of targeted leads they need via online channels alone. CMS privacy restrictions and the outbound targeting limitations of many online channels create challenges to meeting enrollment goals. 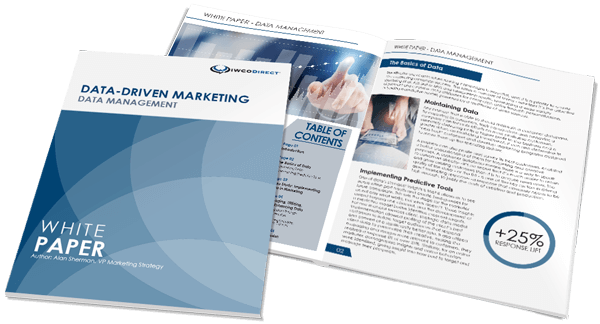 So how do you leverage direct mail to drive as many qualified prospects as possible? It begins with analytics and targeting―especially the development of a predictive model that tells us who is most likely to respond based on previous direct mail campaign responders. The model is applied by IWCO Direct to a national compiled file. In the course of model development, analytics providers such as IWCO Direct will also provide a responder/customer profile to provide detailed demographic and attitudinal insights that can help inform the creative process for more relevant messaging. Combine the two and you’ll be mailing the right message to the right people. An optimal direct mail AEP contact strategy usually begins via an awareness package sent prior to the enrollment period, which begins in October. Although these packages cannot provide plan details until the annual enrollment period begins, this is an excellent way for healthcare providers to differentiate themselves from competitors and set the foundation for subsequent contacts to follow. Follow-up mailing touches are designed to drive prospects to attend informational meetings, call for information, or visit the provider website. Those identified by the predictive model as more likely to respond should receive more contacts, usually three to four over the course of the enrollment period. The last one or two contacts should be targeted to the most likely to respond. Of course, any contact strategy should be informed by an in-depth analysis of the previous year’s campaign. In terms of the creative, the typical Medicare Advantage prospect likely receives direct mail from local healthcare providers, so your creative messaging must differentiate itself and be relevant, informative, and speak to recipients’ needs. Copy should not take an official tone, but be conversational, speaking to the prospect persuasively but simply—acknowledging that Medicare is complicated and difficult to understand while reassuring prospects that your experts are ready to help. As the AEP progresses, your messaging and creative should take on increased urgency in its call-to-action. The outer envelope, letter format, and copy should be varied across the AEP campaign to maintain interest and engagement. Letters will out-perform postcards, which simply do not provide enough real estate to inform and tell the story and may diminish the value of the offering. As in any other industry vertical, personalization in Medicare marketing direct mail almost always means better results. This can include name, references to geographical location along with relevant imagery, a listing of informational meetings within a given radius of the recipient’s home, and more. Testing in AEP direct marketing is essential to optimization. Yet there is the constraint of needing Medicare marketing tactics to perform at the highest possible level during the finite AEP. As my colleague, Tom Hexamer, observed, it’s all about nailing the balance. Some marketers abandon testing due to the high pressure that’s put on marketing during the AEP in the short term. But the consistent lack of testing during AEP prevents many Medicare marketers from optimizing their efforts and achieving future long-term success. Healthcare marketers should test with the understanding that learning will likely be applied the following year and improve enrollment in the long run. Of course, an effective AEP marketing program is a year-round concern and shouldn’t be limited to the annual enrollment period. Medicare marketers must have effective mailing plans in place to handle the age-in marketing process as prospects turn 65 throughout the year. IWCO Direct develops effective and proven AEP strategies, multi-channel marketing creative, analytics, sophisticated variable data, and digital production for healthcare providers—an all-in-one solution. If you are interested in achieving optimal results from your Medicare marketing program, get in touch with us to learn more.